Lucille Noell Dula put together a great little guide for Hillsborough in 1979, which was updated in 1989. It appears to be out of print now, although still available. She puts together a "Walking Tour" (although it would be quite a serious walk to do the whole thing,) focusing on the well-known houses of Hillsborough. 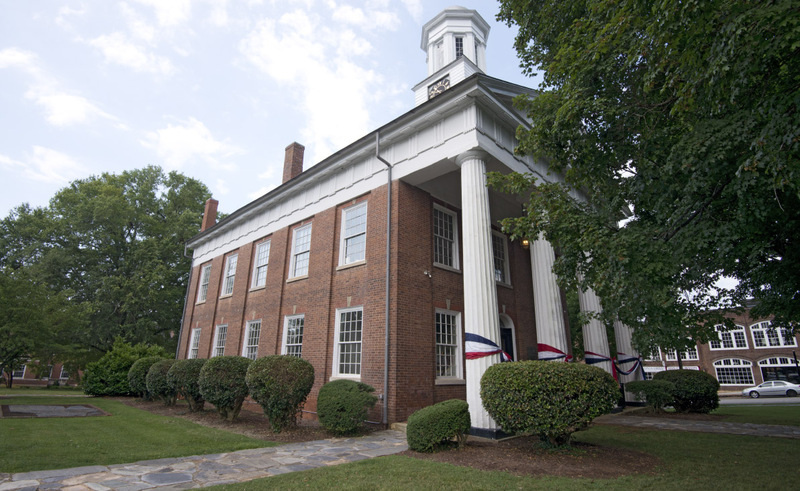 One of the earliest and most architecturally distinguished courthouses in North Carolina, this brick temple-form Greek Revival-style building was designed and built by John Berry, a well-known local architect and builder. The two-story building is three bays wide and five bays deep with a full portico with classical pediment and entablature supported by four fluted Doric columns. Such fine details as the Flemish-bond brick walls, wide cornice, twelve-over-twelve wood-sash windows with flat brick arches, keystones, and stone sills, and the central double-leaf door with fanlight, brick voussoirs, and keystone remain intact. There are four interior brick chimneys and the original two-stage cupola clock tower surmounts the building. The courthouse is at least the fourth on this site. The interior retains most of its original finish, including a pair of open-string Federal-style stairs with foliate brackets, turned balusters and newels and heavy molded handrails, four-panel doors, symmetrically molded frames with cornerblocks, and well-proportioned pilastered mantels. The upstairs courtroom was renovated in the 1880s. 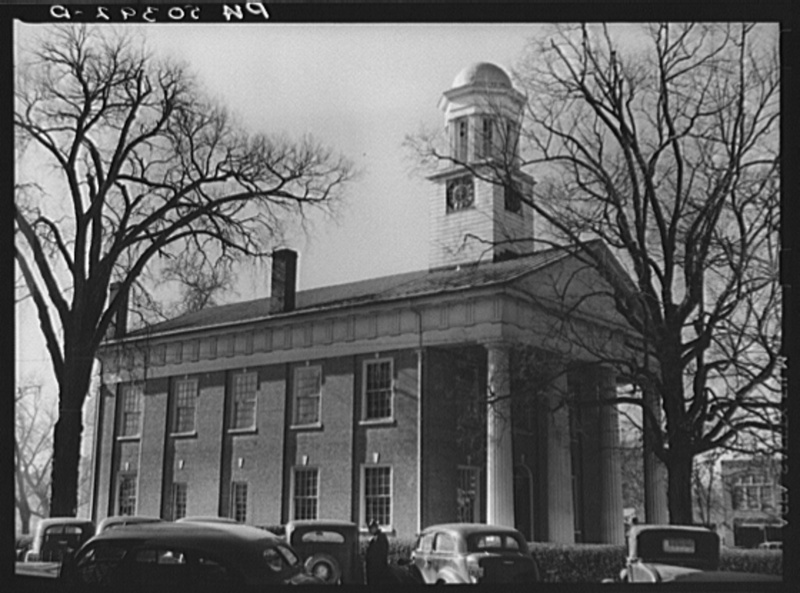 "Very old courthouse in Hillsboro, North Carolina." Marion Post Wolcott, Farm Service Adminstration. December 1939. Retrieved from LOC. A new Orange County Courthouse, directly to the south across East Margaret Lane, was built in the 1950s. "Governor of N.C., was captured in Hillsboro by David Fanning and his Tories, Sept. 12, 1781, and taken to Charleston, S.C."
Norwood Law Office, which stands on its original site in the extreme southwest corner of Lot 2, is the only surviving of three offices shown on this lot on an 1839 map. The one-story, front-gabled, Federal-style building is constructed with a one-to-five common bond brick and has boxed eaves. The one-room building has nine-over-nine wood-sash windows with flat brick arches and operable wood shutters. 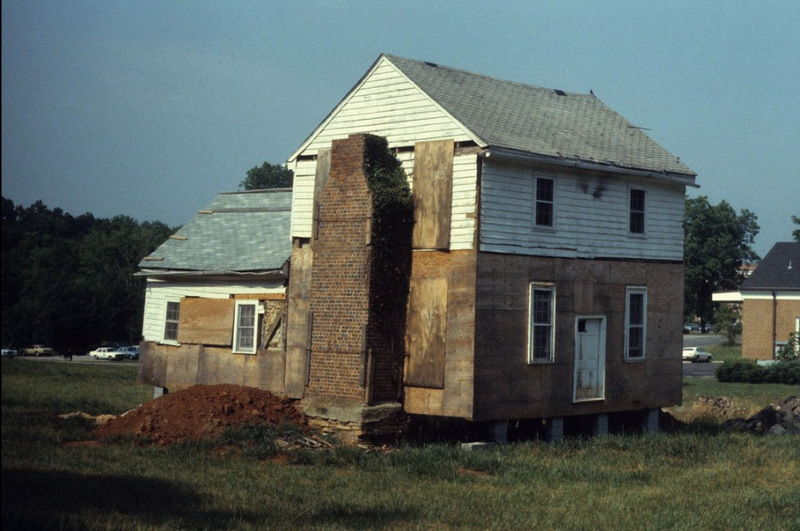 There is a one-to-five common bond chimney in the rear (east) gable and the stone foundation has been covered with stucco on the right (south) elevation. A standing-seam metal roof has been replaced with wood shakes. A six-panel door on the west elevation, faces the Orange County Courthouse. The interior features a Federal-style mantel, brick hearth, and continuous wainscoting. The office may have originally belonged to Judge William Norwood who died in 1842. Local historians have noted that the office was occupied by Cadwalader Jones in the mid-nineteenth century, presumably through a lease as a deed conveying title to him is not known to exist. In 1866, attorney Richard Ashe sold the office to John Wall Norwood for 0. Norwood was a member of the General Assembly in 1858 and a state senator in 1872. The Orange County Commissioners purchased the building and used it as the Veteran's Administration office. 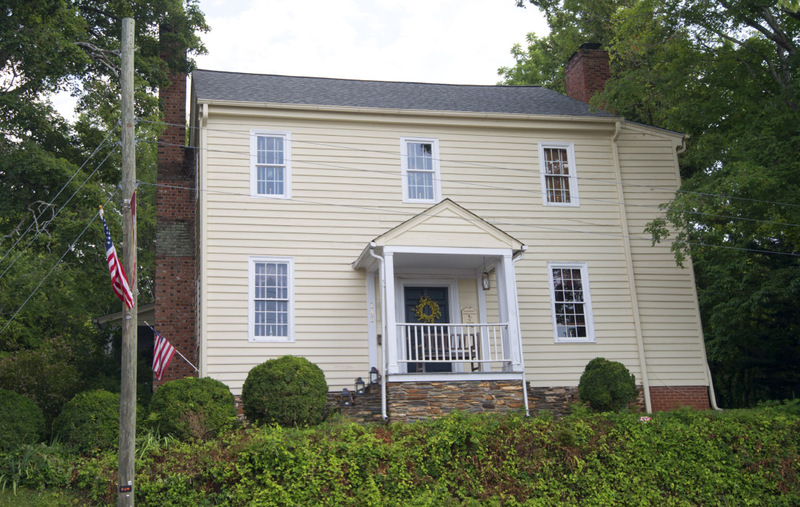 1801 house of William Courtney was used as Hillsborough's first telephone exchange in the early-to-mid-20th century. This two-story, side-gabled, Georgian-style house stands on a hill high above King Street with a brick retaining wall at the sidewalk. The house was originally at street level, but the street was lowered some years ago. 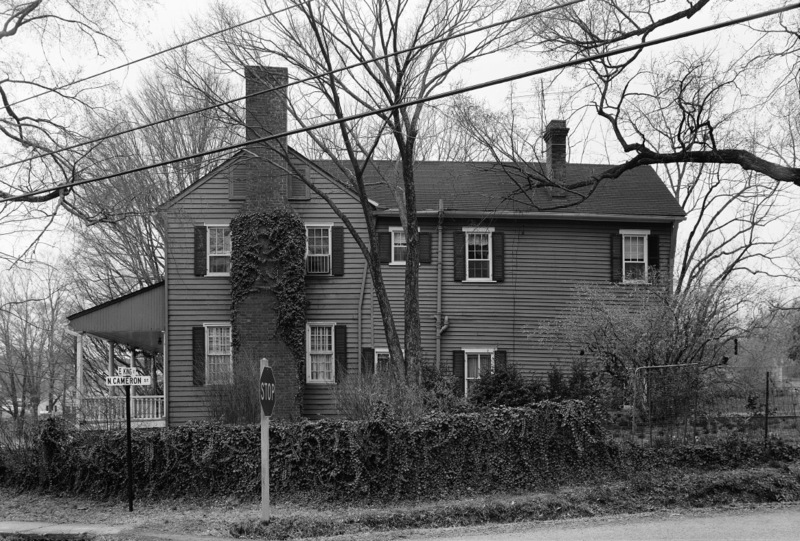 The center-hall-plan house is three bays wide and single-pile with a rubble-stone foundation, beaded weatherboards, nine-over-nine wood-sash windows on the first floor façade, four-over-six wood-sash windows on the side elevations, and replacement vinyl windows at the second floor. Exterior brick chimneys in each gable end are of Flemish-bond construction. 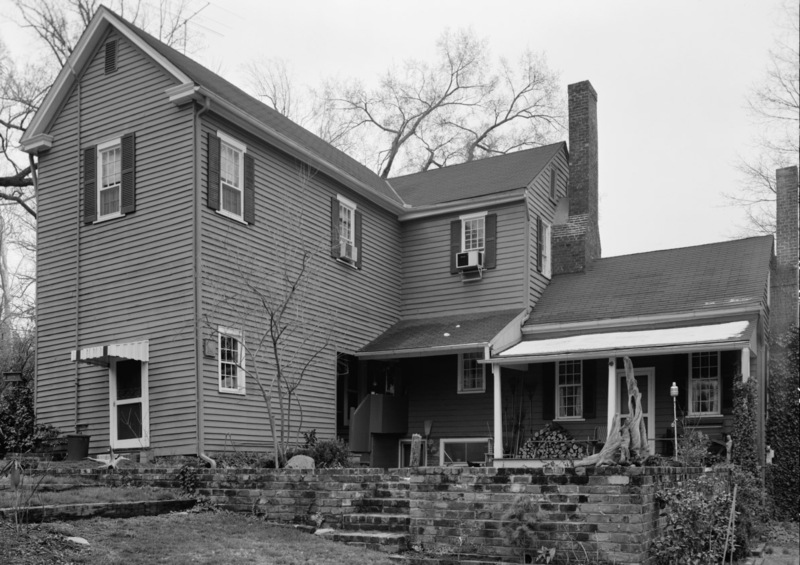 The left (west) chimney is double-shouldered and the right (east) chimney has been encompassed by a two-story, shed-roofed addition on the right elevation. The six-panel door is sheltered by a replacement front-gabled porch, constructed in 1983, supported by grouped square columns on a rubble-stone foundation. 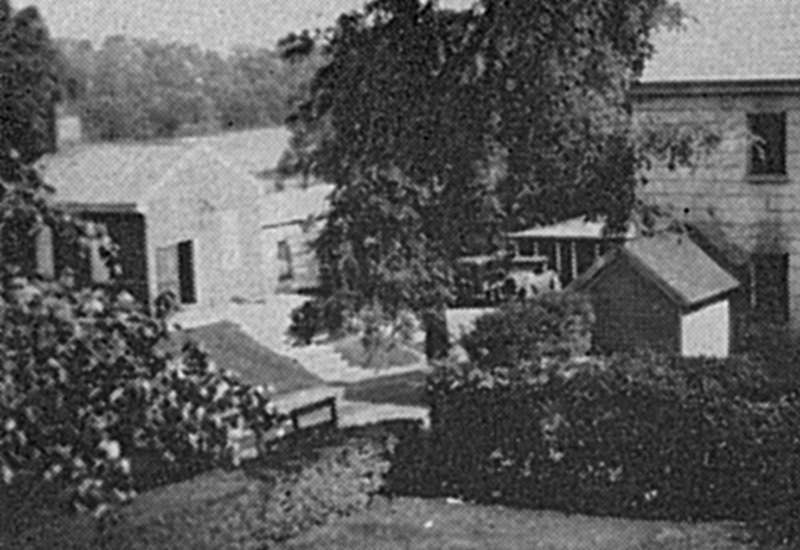 There is a full-width, one-story, shed-roofed wing and a one-story, gabled ell at the left rear (northwest). A shed-roofed screened porch on square columns extends along the left elevation of the rear ell and there is a one-story, shed-roofed wing to the right of the ell. William Courtney purchased the lots in 1777 from Ralph McNair. In a deed conveyed in 1801 from William Courtney, Jr. to his brother Joseph, the term "yellow house" is first used, implying that a house was on the property. Although the house has undergone several renovations, it retains fine paneling in the west parlor and one bedroom and a distinctive west parlor mantel. 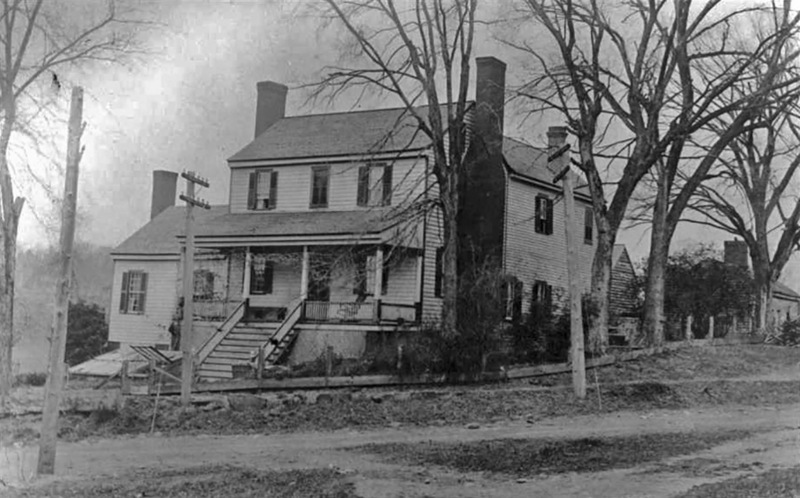 The house was also used as a telephone exchange according to the 1924 Sanborn map. The two-story, shed-roofed wing on the east elevation appears on the 1888 Sanborn map. No porch is shown on the map until 1905 when a full-width porch is shown. 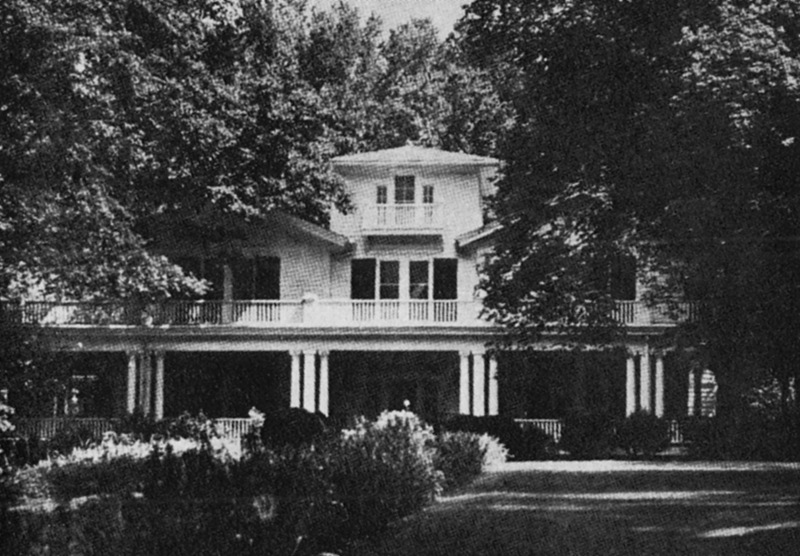 A wrap-around porch is shown on the 1924 and 1943 Sanborn maps. 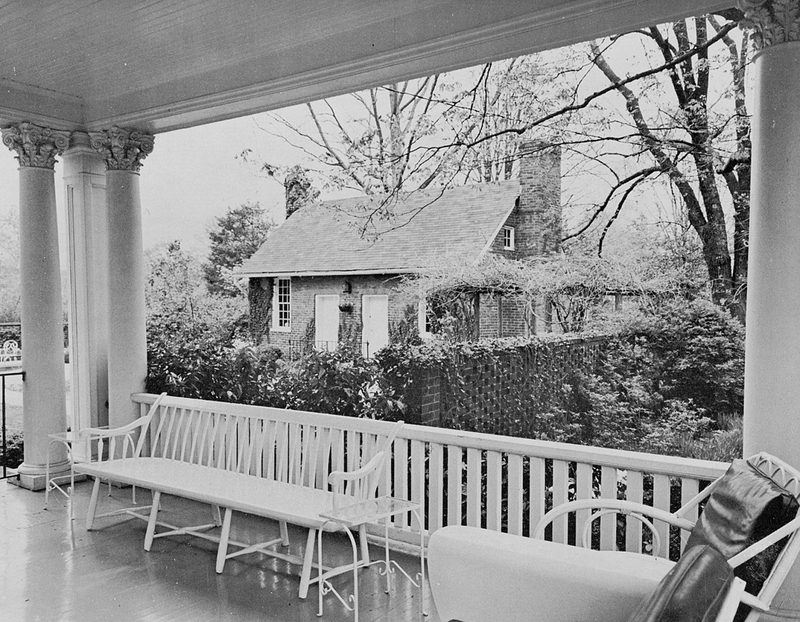 By 1973, the porch had been removed and a new porch, appropriate to the design of the historic building, was constructed in 1983. 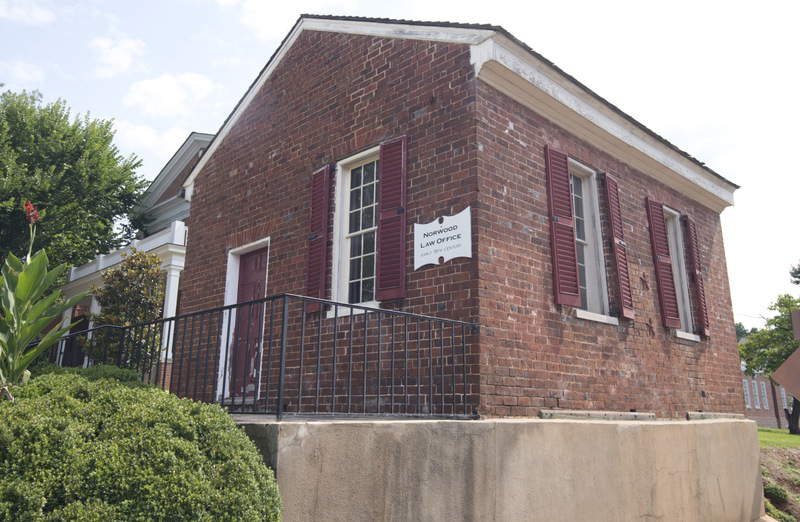 "Although the Courtney House was once a tavern allegedly visited by Lord Cornwallis, it is best known as Hillsborough's first telephone office. 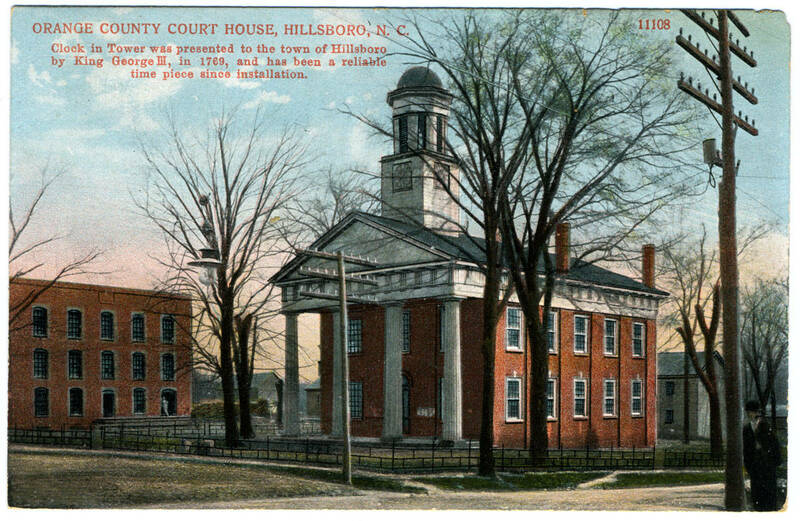 In 1906, the Morris Telephone Company tried to rent a building here [in Hillsborough], but found it difficult; the townspeople were afraid the equipment might be struck by Iightning. Finally, Henry Murdock agreed to rent them a room in his home (the Courtney House), and his daughter, Mamie, became the first switchboard operator. When she began her duties there were fifty patrons and she was paid fifteen dollars a month and given time off to attend church on Sundays. She liked to work and contmued as "Central" after her marriage to William A. Gordon. 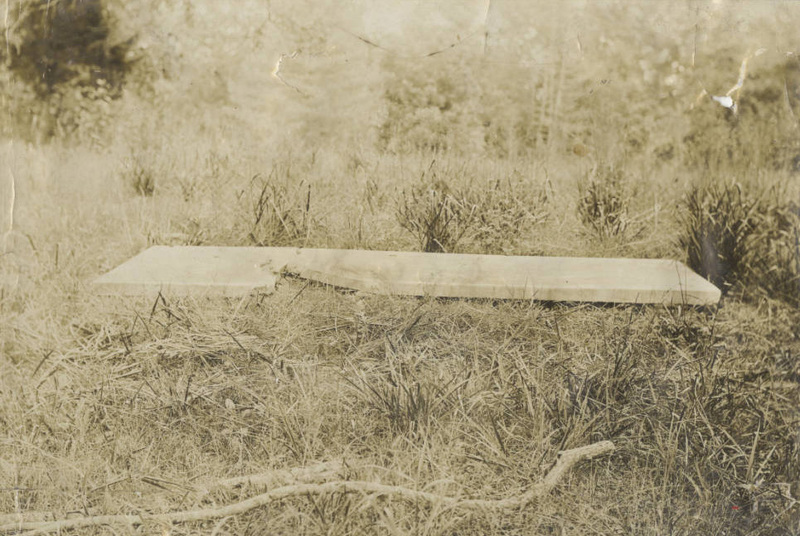 When her husband died in 1920, she had three children to support, but by then there were more telephones in Hillsborough and her salary was larger. The two sons graduated from the Univesity of North Carolina, and the daughter from Peace College. "Miss Mamie" had only one serious illness while she was with the telephone company: appendicitis. She was in the hospital for thirty days, and the family manned the switchboard. Although she was seriously ill, she later said she never doubted she would recover, but almost everyone else was doubtful. 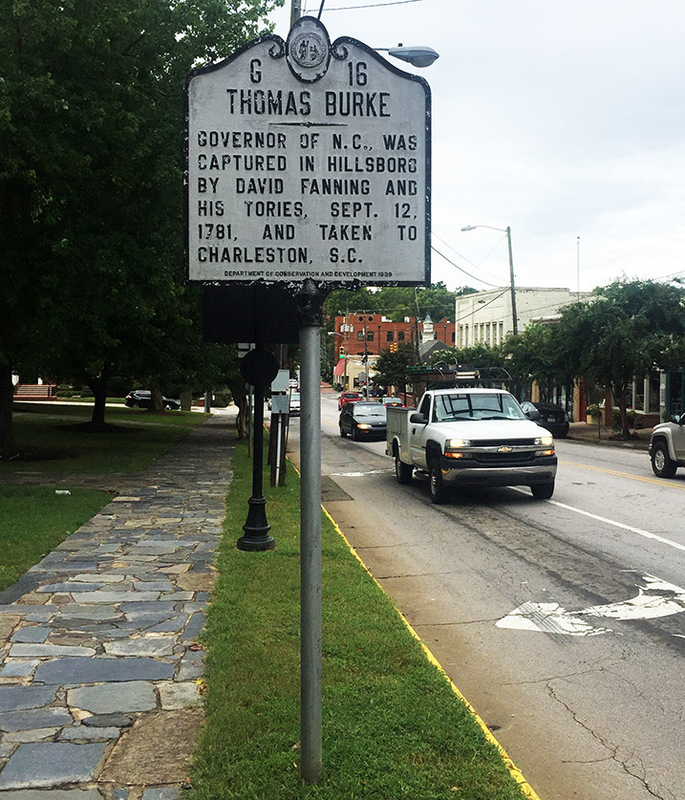 There are many stories about the ways "Central" served the people of Hillsborough. For many years there was no public water system, and the local 'bucket brigade' had to be alerted when there was a fire. There were also only a few officers, all of them with double duties, and they had to be summoned by Miss Mamie. Once when a number of people were seriously ill and several deaths occurred within a short time, she stayed at the switchboard for forty-two hours to provide emergency assistance and get messages to distant relatives. Many World War II GIs learned, too, that Hillsborough's efficient telephone operator provided them with a lifeline home, Once she was up virtually all night when some local sailors arrived in California, forgot the time difference, and began to make calls after midnight Eastern Standard Time. Miss Mamie left the switchboard in 1948 when Morris installed the dial system, but remained briefly to handle routine duties. When the townspeople presented her with a check -small by current standards- she said she had given less than she had received However, Htllsborough's subscnbers were grateful to an operator who rarely rang wrong numbers, made unlisted numbers unnecessary, and made prank/crank calls impossible. Today the old telephone office bears the name of William Courtney, a prominent early Quaker. However, to those who remember the voice that said, "Number, please," the house will always be the office of Mamie Gordon, 'Central' for forty-two years." The telephone exchange didn't move far; the company constructed a building across the street (120 East King Street) from the Yellow House; that building remains in use today as a central (unmanned) switching station for CenturyLink, the local phone company as of 2016. 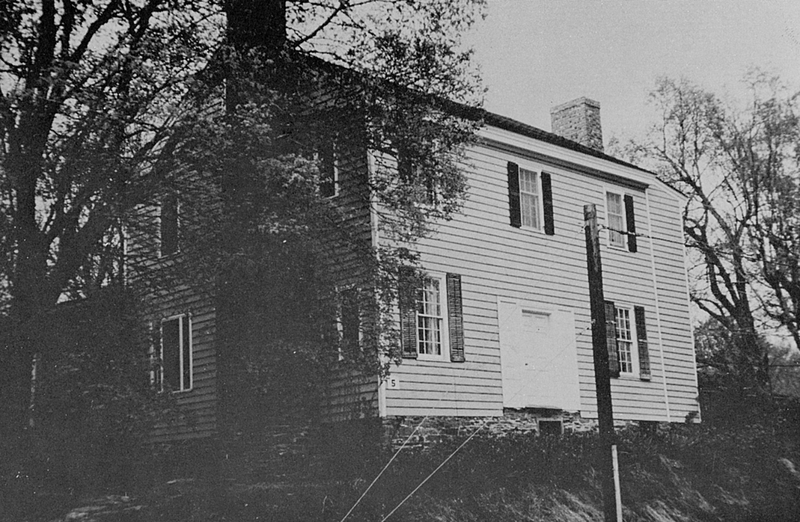 This Federal style house was built ~1790 and was the property of Alexander Dickson when CSA General Johnson made it his headquarters for the largest surrender of the Civil War. Moved to downtown Hillsborough in 1983 to avoid demolition, and repurposed as a visitor's center. 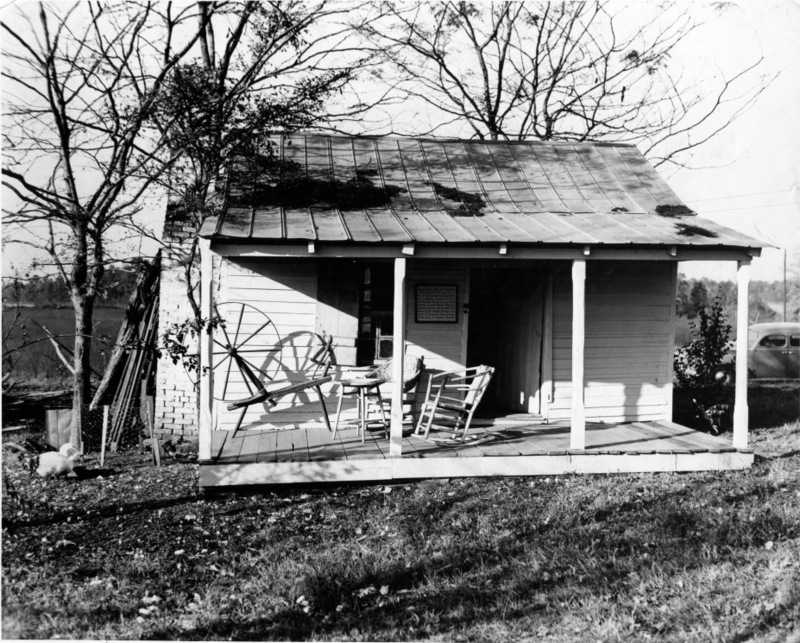 Outbuilding on original Dickson Farm, 1960s. Here took place the discussions regarding terms of surrender by General Johnston, Confederate Secretary of War Breckinridge, Mr. Mallory, and Confederate Governor Vance. From here, General Johnston with his staff rode along the old Hillsboro-Durham Road April 27 to make his final surrender of his army to General Sherman." 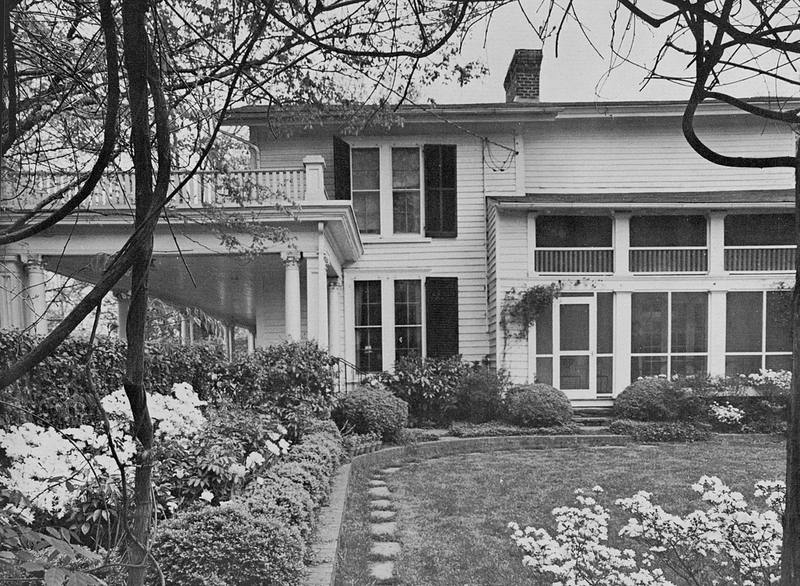 The house was moved in 1982 to an empty lot at the corner of East King and South Cameron Streets. 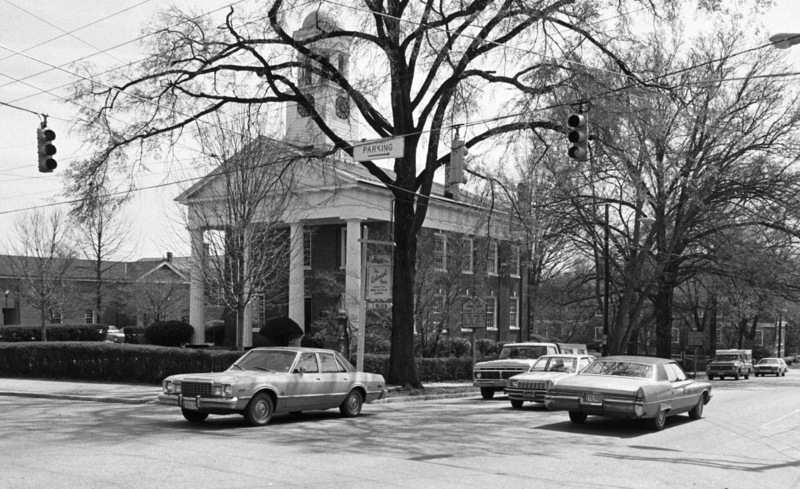 After move to downtown Hillsborough, 1982. This two-story, late-Georgian-style house was moved to its present site in 1983 from the junction of I- 85 and Highway 86, just outside of Hillsborough, and now serves as the Chamber of Commerce and Visitors Center. The side-gabled house is three bays wide and two bays deep with a rubble-stone foundation, beaded weatherboards, an exterior Flemish-bond brick chimney on a stone base in the left (east) gable, and a wood- shingled roof. It has nine-over-nine wood-sash windows on the first floor with six-over-six windows at the second-floor level. The raised six-panel door is sheltered by a reconstructed, full-width, shed-roofed porch supported by chamfered posts. 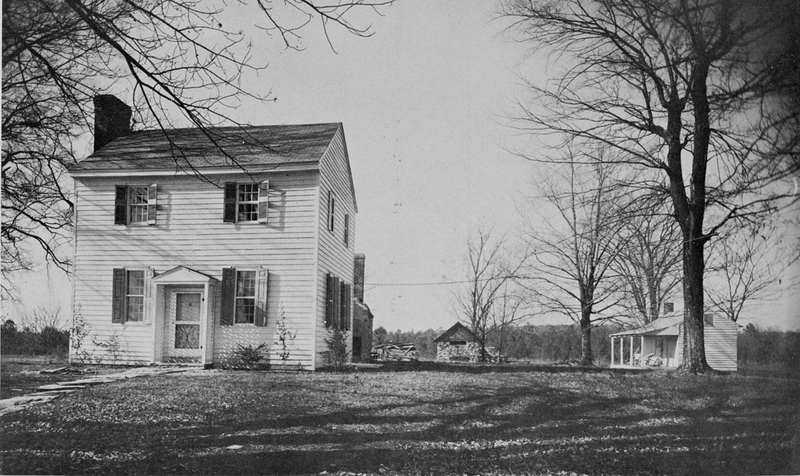 There is a one-story, gabled ell at the left rear (southeast) with a combination of six-over-six and four-over-four wood-sash windows and a shed-roofed porch along its right (west) elevation that is supported by chamfered posts. A modern access ramp leads to an entrance on the left elevation of the rear ell. The interior, a three-room plan with a center-hall and enclosed staircase, retains much original fabric, including wainscot, doors, and mantels. 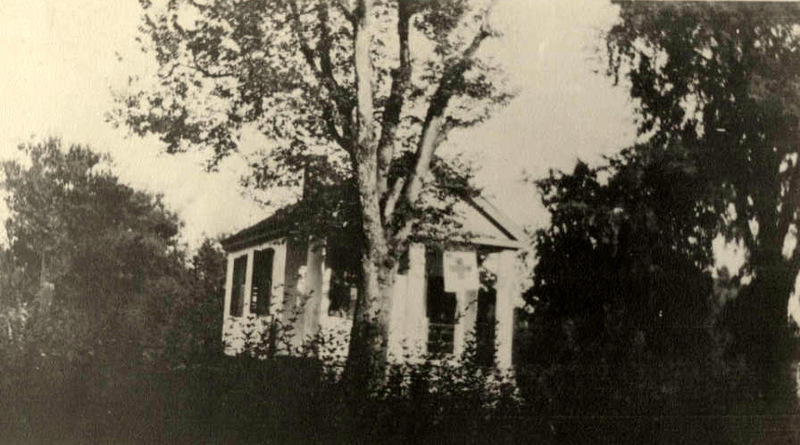 The house became the property of Alexander Dickson around 1839. 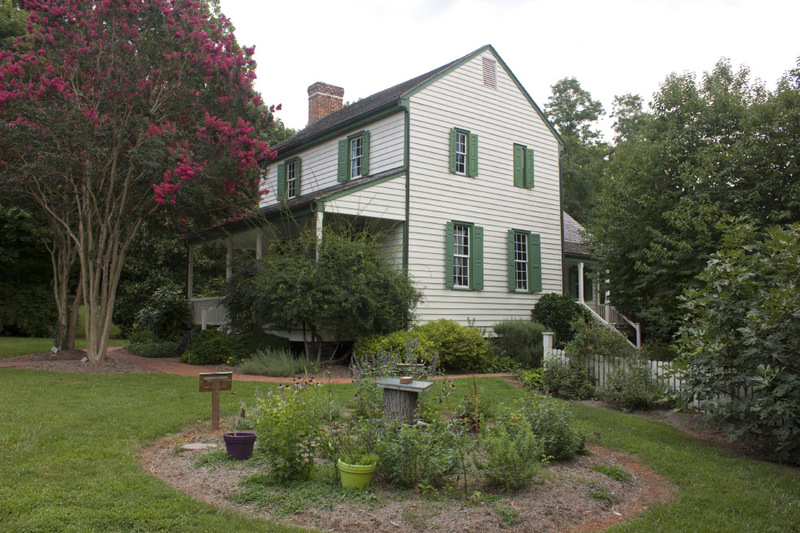 In 1865, General Joseph E. Johnston used the house as his temporary headquarters. William Reed's Ordinary, also known as Seven Hearths, is an 18th century Federal-style structure on East King St. Seven Hearths, a house built on five levels, is an excellent example of Piedmont Architecture. [...] Interesting features include its huge chimneys, reeded mantels, and seven fireplaces. Africa Parker, a freedman, once operated a still house near the western boundary of the lot. The property is sometimes referred to as the 'Stillhouse Lott,' and the stream is called the 'Stillhouse Branch.' A large specimen magnolia now stands near the still house. 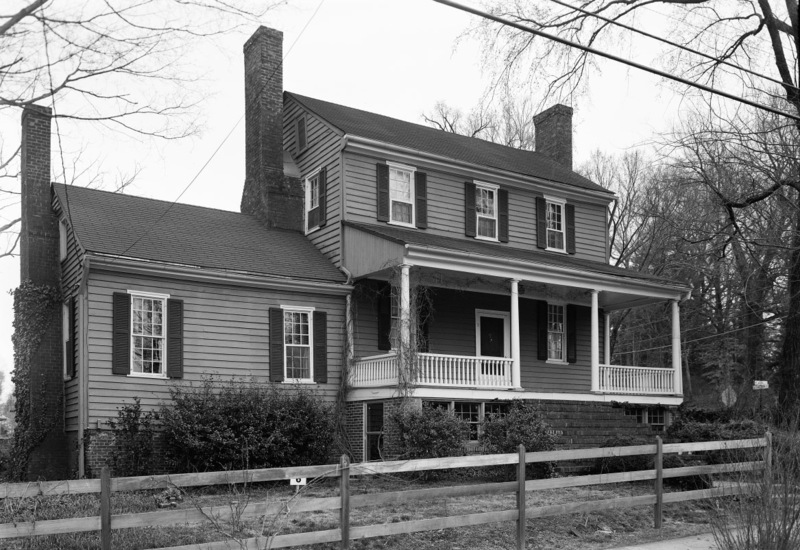 This important early landmark is an example of the Federal style, though the core may be a Georgian-era structure. The two-story, side-gabled house is three bays wide and single-pile with beaded weatherboards, boxed eaves, nine-over-nine wood-sash windows on the first floor, and nine-over-six windows on the second floor. The six-panel door is centered on the façade and sheltered by a full-width, shed-roofed porch supported by slender Tuscan columns with a turned railing between the columns. Exterior end brick chimneys flank the main block of the house. The east chimney is laid in a Flemish bond with glazed headers. The west chimney is partially obscured by a c. 1830 1-story side-gabled wing addition which itself has an exterior end chimney laid in one-to-six common bond. The one-story wing has nine-over-nine wood-sash windows with six-light windows flanking the chimney. 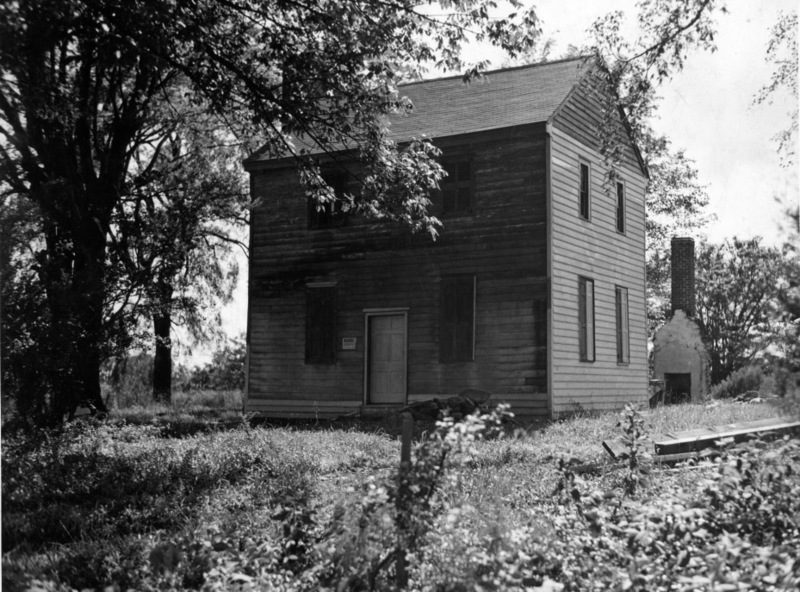 There is a two-story gabled ell at the right rear (northeast) with an interior brick chimney and an eight-over-eight wood-sash window flanked by four-over-four windows on the right (east) elevation of the first-floor. 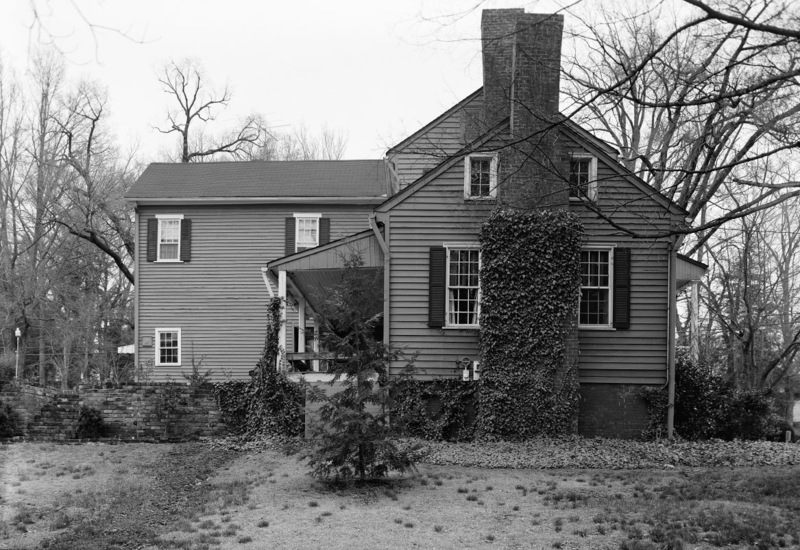 There is a one-story, shed-roofed porch on the left (west) side of the rear ell and on the rear (north) elevation of the side-gabled wing, each supported by slender square columns. Mrs. William Hayes had a large flower garden here from 1877 to 1919. At that time, the gate was to the right of the present one, and rock steps led to a porch and east entrance. Under the porch there was a greenhouse, heated by an oilburning stove and lamps, Potted plants stood on the retaining rock wall, and many of these were held over winter in a brick flower pit in the front yard. Sun shining through the glass cover, kept the pit warm in winter. Violets and geraniums bloomed inside and, after Christmas, fragrant freesias. There is still a branch running through the garden and continuing across the open land in front of the house. This stream, The Still House Branch, formerly serviced a tanyard. The lines of the ditches they used can still be traced. There was formerly a small house in the garden, which was used by Rev. Mr. Donnely, who was at St. Matthews between 1848 and 1855, while Moses Curtis was in Society Hill. During the Civil War, the main house was used as a hospital for convalescent soldiers. Dr. and Mrs. Robert J. Murphy began the work of restoration in 1954, and have developed a particularly colorful and charming terraced garden. There are many interesting old roses, remaining from plantings of long ago. 1960s - "postcard" retrieved from eBay listing; no original attribution. 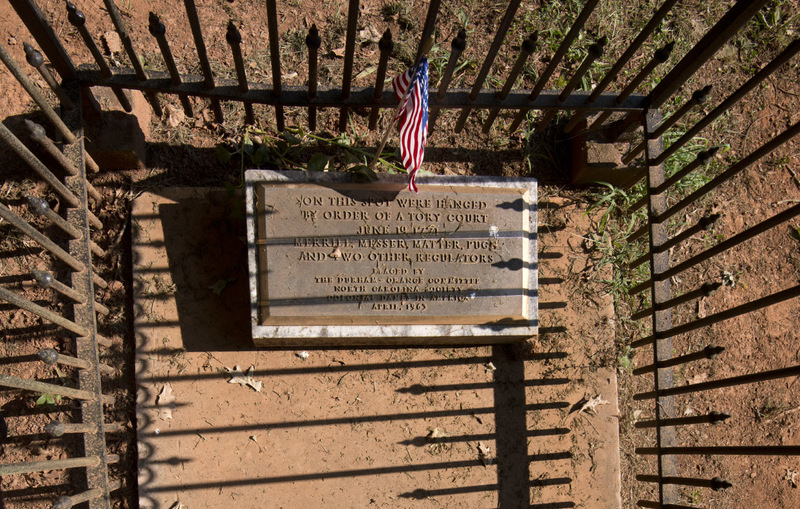 "On this spot were hanged by order of a Tory Court, June 19, 1771, Merrill, Messer, Matter, Pugh and two other Regulators. 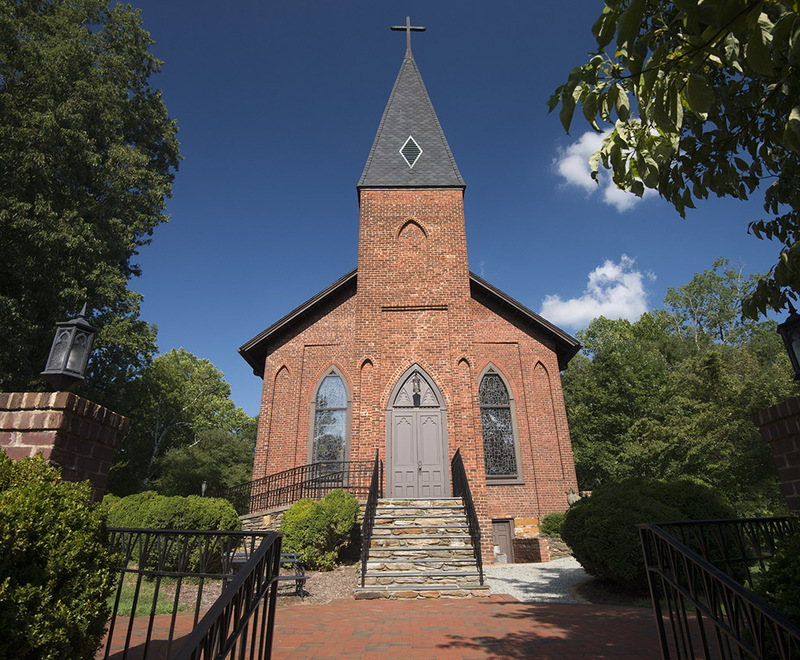 Placed by the Durham-Orange Committee, North Carolina Society Colonial Dames in America, April 1963,"
Sited high on a hill overlooking St. Mary's Road, St. Matthews Episcopal Church is an outstanding example of the early Gothic Revival in North Carolina and is listed individually in the National Register of Historic Places. The three-bay-wide, front-gabled, Flemish-bond brick building has a slate roof and fine lancet windows. The brick detailing includes recessed gothic-arched panels as well as rectangular recessed panels to frame the gothic-arched stained-glass windows. A pyramidal-roofed entrance tower on the west elevation contains an arched entrance with double doors with intricate flat paneling and a molded surround encased in a double row of brick headers. The tower, which was reworked and the spire added in 1875, has a blind gothic- arched panel on the façade and diamond-shaped vents in the slate roof. The chancel, at the east end of the building, is apparently a later addition also. It has a three-part arched window on the rear elevation and six- panel doors with gothic-arched transoms on the side elevations. Modern stone and slate steps access the front entrance and the churchyard is enclosed by a brick wall that extends to St. Mary's Road following the boundaries of the property. The land on which St. Matthew’s was built was conveyed verbally by Thomas Ruffin around 1820. His deed, dated April 10, 1854, conveyed 1 1/3 acres, but this has been progressively enlarged to accommodate the church, parish house, and a brick-walled cemetery. The church, built between 1825 and 1826, was designed by William Nichols in the Gothic Revival style. He specified the building to be 35' by 45', because "a less width would not be proportionate with the length." The building was constructed by local masons John Berry and Samuel Hancock. Today it stands as a tribute to these fine designers and builders. 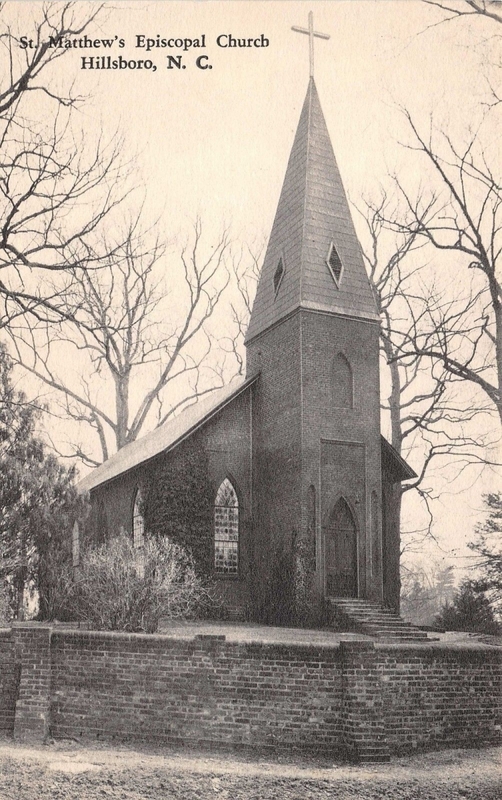 The church replaced an earlier structure at the northwest corner of North Churton and West Tryon streets that burned in 1793.